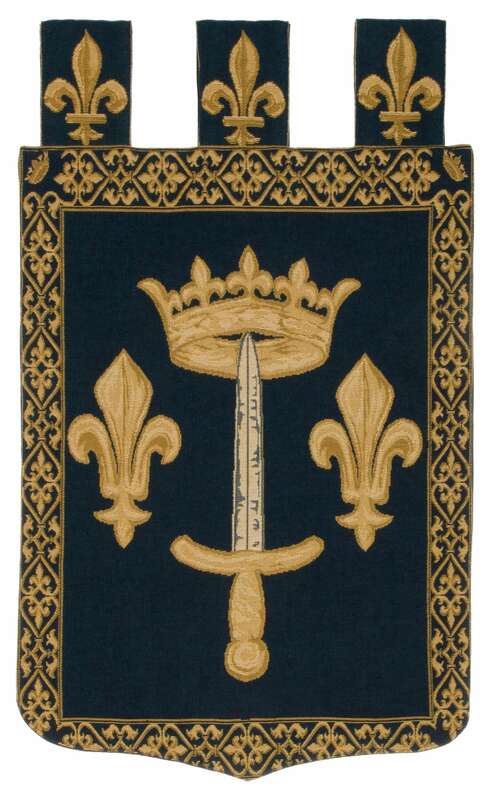 This Museum Collection wall tapestry shows the Joan of Arc coat of arms on a chenille blue background. The fleur-de-lis or fleur-de-lys (plural: fleurs-de-lis) is a stylized lily (in French, fleur means "flower", and lis means "lily") or iris that is used as a decorative design or symbol. It may be "at one and the same time, religious, political, dynastic, artistic, emblematic, and symbolic", especially in French heraldry. The wall tapestry has 3 loops with a Fleur de Lys design to insert a rod for easy hanging on the wall. It is woven in Belgium on a jacquard loom with 100% cotton chenille thread. It is lined with a beige cotton backing and. The gobelin quality is obtained by a denser, thicker weft and as such is somewhat heavier than the regular tapestry quality. An absolutely gorgeous piece of art! I love it--it's perfect.